The Chilling Adventures of Sabrina won’t end anytime soon. Variety reports Netflix has renewed the TV show for a second season. Like the first season, the new episodes will be released in two. 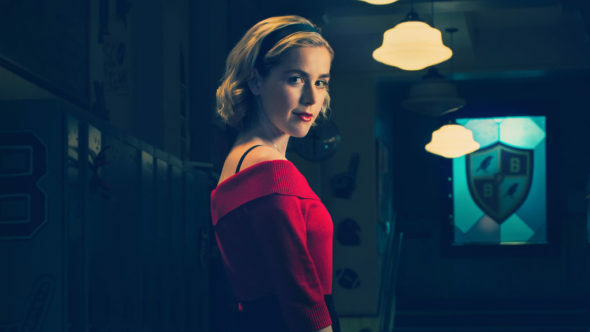 A companion to Riverdale, the supernatural series centers on Sabrina Spellman (Kiernan Shipka), a sophomore at Baxter High in Greendale (a town nearby Riverdale), who is half-mortal and half-witch. The cast also includes Ross Lynch, Lucy Davis, Miranda Otto, Chance Perdomo, Jaz Sinclair, Michelle Gomez, Gavin Leatherwood, Richard Coyle, Lachlan Watson, Bronson Pinchot, Tati Gabrielle, Adeline Rudolph, and Abigail Cowen. Netflix has ordered an additional 16 episodes of Chilling Adventures of Sabrina which will be split into two groups; parts three and four. Production on the new episodes will begin in 2019. Paws what you’re doing. Salem’s got some special news for you. Listen up right meow. What do you think? Are you a fan of Chilling Adventures of Sabrina? Are you glad it’s coming back for a second season? More about: Chilling Adventures of Sabrina, Chilling Adventures of Sabrina: canceled or renewed?, Netflix TV shows: canceled or renewed? Netflix picked up two seasons when they bought the series. One was released in 2018 and the second will be released in 2019. It wasn’t one season. Great show. Bring on the next season .